MIAMI, FL -- As far as art shows go, Art Basel Miami Beach is a stunner. Unlike other shows that work like pop-up shops in host cities, Art Basel fully expects a city’s character to shape and inform the galleries and artists they invite. In the case of Art Basel Miami Beach, this means the show goes on with the gravitas of fantastic modern and contemporary art mixed with the charm and coolness of the Americas. 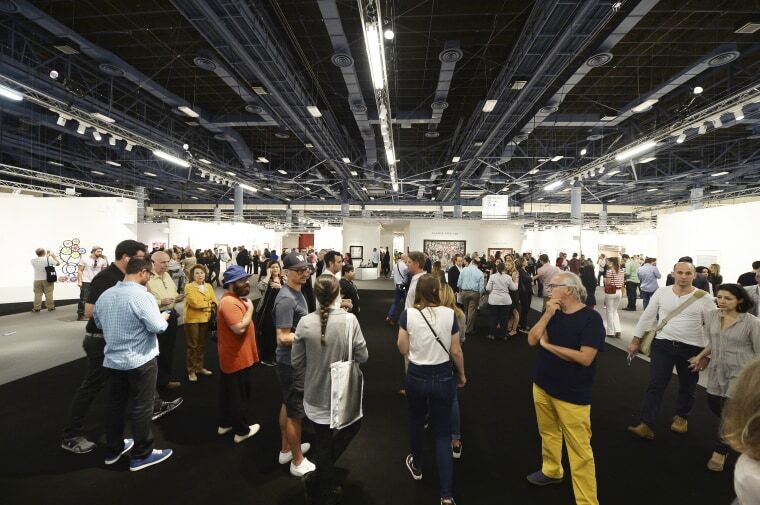 From December 3 to December 6, 2015, the Miami Beach Convention Center is transformed into a series of long aisles where two hundred and sixty seven galleries from thirty two countries from around the world settle in to offer international collectors and spectators the best of what their artists have to offer. In turn, Miami provides a gorgeous setting as the proverbial capital of Latin America where locals and visitors alike make the people watching almost as interesting as the art that’s selling for record highs. The entirety of Latin America and the Caribbean is represented in the offerings as well as the players and it makes for a thrilling show. Walking through each axis is lovely, if only because of the diversity of perspective. A Joan Miró hangs a glance away from a Carmen Herrera which is paces away from a Botero statue. Celebrities like Alex Rodriguez, Leonardo DiCaprio, Lenny Kravitz and Sly Stallone peruse the temporary gallery set ups with their entourages,taking in a Chris Ofili series or Louise Nevelson’s work as maintenance employees rush between the cafe and prepare areas. Some of the worlds biggest art dealers and clients are ushered in and out of small hidden rooms in each booth housing a rare Basquiat or Picasso and the air is charged with restrained yearning and controlled excitement. What always impresses me about Art Basel Miami Beach is how much of the ultra VIP crowd is made up of Latin Americans. The hum of Spanish and Brazilian Portuguese can be heard throughout the great hall in all its shades and accents. The entirety of Latin America and the Caribbean is represented in the offerings as well as the players and it makes for a thrilling show. Some would argue that the quality of Latin American art is creating a buzz beyond its borders as well. Alberto Barral, a much sought after art advisor, has noticed the increased visibility. “The globalization of Latin American Art is more evident than ever at this Art Basel because one can find their works propping up, unexpectedly, in galleries that do not necessarily have Latino artists in their roster.” The work is speaking for itself, loudly and the art world is catching up to the market at a furious pace. This was evident with Carmen Herrera at the Lisson Gallery and Botero at the legendary Galerie Thomas from Munich. Pablo Atchugarry’s marble statues held its own at several galleries and Jack Shainman is representing Yoan Capote. Not be be outdone, both Colombian Oscar Murillo at David Zwirmer and Chilean artist Ivan Navarro both had impressive sales to kick of the exclusive first day. Market success and overall curiosity are making that room even bigger. Gallerist Sean Kelly thinks interest is also being fueled by changing geo-political landscapes, such as the recent changes between the U.S. and Cuba. All of these elements come together to make Art Basel Miami Beach the perfect place to find diverse, show- stopping art at every booth. The storied event is giving artists a little more room to breathe and create, galleries a place to expand their market, and Miami another opportunity to shine.